On Sunday, a Thai election officer began counting votes at a polling station in Bangkok. 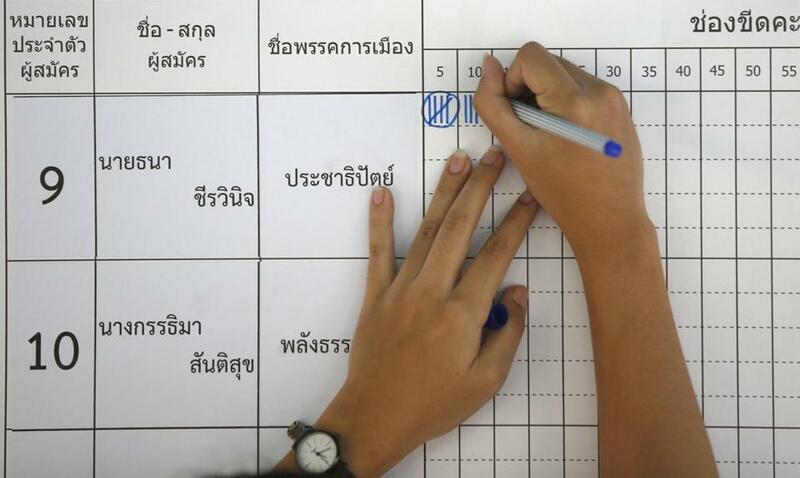 BANGKOK — Thai election authorities on Thursday ordered a recount of votes and new elections in some polling areas after finding irregularities in last month’s general election. The commission has come under heavy public criticism over its alleged mismanagement of the nation’s first poll since a military coup in 2014. It was mainly accused of releasing delayed and inconsistent results. Thursday’s orders were the first actions it has taken since the election to rectify problems or address complaints and protests. It has said it has received more than 100 protests, but it is not clear how many have been handled so far. The commission also has the power to disqualify winning candidates, and there is concern that if it exercises that right, it could substantially affect the final certified vote totals that are due to be released on May 9. The preliminary totals gave no single party an absolute majority, so disqualifying candidates and parties could determine whether parties favoring Thailand’s current military government, or those opposing it, will have a majority in the House of Representatives. Sawaeng Boonmee, the commission’s deputy secretary-general, said the date for the new voting will be announced later, but it will likely take place after Thailand’s New Year’s holidays in mid-April. Voting irregularities aside, the election was controversial because the junta that took power after the coup granted itself to rewrite the country’s laws, including commissioning a new constitution and creating an electoral system that severely disadvantages parties without links to the military.